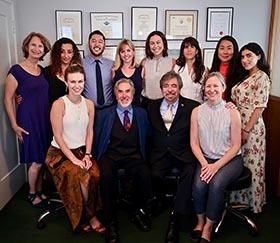 The Program is a one-year, part-time comprehensive training for physicians, licensed acupuncturists, and students of Oriental Medicine. Read what graduates say at the bottom of this page. Watch this new 3-minute video on the Program and hear Professor Gumenick and graduates (M.D and L.Ac) share their experience of this life-transforming work. Beginning the Journey™ is a two-day in-depth introduction to the heart and soul of Classical Five-Element Acupuncture, appropriate for practitioners and non-practitioners alike. "This course brought light and faith back into my life. Neil is honestly the best teacher I have ever had the honor of meeting and learning from." "Great course, by far the best CEU class I have ever taken. The level of knowledge, enthusiasm, and engagement with the students was a breath of fresh air. I would recommend the course to anyone interested in seriously and authentically deepening their practice and themselves." 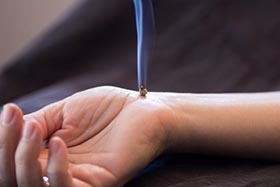 The Classical Five-Element Acupuncture Graduate Seminar is an opportunity to refresh your memory and your senses as we cover all aspects of Five Element practice: Clinical practice with patients, Spirits of the Points, pulse feedback, point location, interviewing skills, treatment planning, sensory exercises to sharpen diagnostic skills. Join Neil Gumenick, Eliot Ivanhoe, and Mary McCullough and re-experience the magic of being together in this work. About Five-Element Acupuncture treaments and the private practice of Neil R. Gumenick. Common Questions and Answers for current and prospective patients. 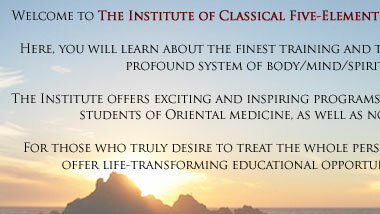 The Institute of Five-Element Acupuncture, Inc. is proud to announce that you can now find us on Facebook. Please visit our page now and Like Us to show your support and keep up with our many events and other institute news. We thank you for your continured patronage. Get the latest Institute News and Program Announcements delivered straight to your Inbox! The cover story in the April issue of Acupuncture Today features Professor Gumenick�s latest article: Spirit of the Points: The Heart. We are happy to announce new dates for our Beginning the Journey™ seminars taking place March 16-17 in Santa Monica, CA and June 15-16 in San Diego, CA. Please join us. In this 47 minute presentation, presented live at the 2016 Pacific Symposium, Professor Neil R. Gumenick explains the Basics of Classical Five-Element Diagnosis - the Concept of the Causative Factor of Disease, the 4 Pillars of Diagnosis, and the Spiritual Dimension of Treatment. 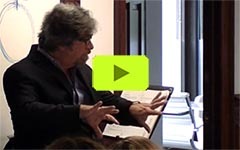 Watch Neil's inspiring 27 minute talk, recorded in a recent Beginning the Journey™ seminar, on Windows of the Sky - some of the most powerful and spiritually enlightening points in all of acupuncture. When used correctly, these points can literally release patients who are stuck in an internal "prison" and open up a pathway to freedom. Learn when, why, and how to use them, as well as the deep spiritual meanings of each point. We are pleased to announce that all current Institute live Seminars and Programs have been approved for Continuing Education credit by the California Acupuncture Board, the NCCAOM, and have been approved for AMA PRA Category 1 Credits™ sponsored by the American Academy of Medical Acupuncture. Spirits of the Points: "The Not So Common Ones"
You can now order Neil's popular training presentations on both DVD as Audio CD. Click each link for more information about the content and to order. » Spirits of the Points: "The Not So Common Ones"
Download Professor Neil Gumenick's latest articles on Five-Element practice. Both Part 1 and Part 2 are now available. Our thanks to Road To Bliss for posting two videos by with Neil from a few years back. View them now on YouTube! Eye opening and awesome. Most profound is the emphasis on treating the spirit - not something I ever knew was possible with this modality. I cannot overstate how important this Program is. It truly brings healing and connection, empathy and rapport back to the field of medicine. Simply stated: the best 5 Element experience in the world. It deepens all knowledge in acupuncture. Beautiful! I feel I got exactly what I was looking for and more. I now know the pure Five Element style of treating patients and I know how rare and precious it is! I knew this would be an amazing, life-changing experience when I signed up, but this Program has far surpassed my wildest imaginations. Not only have I learned the practical skills to be the healer I always dreamed of being, but the personal growth I have gained in developing these skills has spread to all areas of my life. Very profound information, made applicable with excellent teachings, lectures, supervised patient examinations, and wonderful feedback. This course transformed my practice and my life for the better. It has resulted in much better results for my patients and a much greater sense of satisfaction in my work. I very highly recommend this program. Excellently designed program that has truly changed my life. I had tried running away from acupuncture numerous times in the past, but somehow I was always being pulled back. Now I understand that it was because I had to study this. I was meant to practice Five Element acupuncture. This course opened my eyes and my heart to a beautiful and profound side of acupuncture I never knew existed. It helped me connect with my patients on a deeper emotional and spiritual level I had never reached before. I strongly recommend this course to any practitioner who truly wants to transform the lives of their patients and themselves. Neil's class is one of the best organized and best taught that I have ever experienced in 30 years of medicine. The way he models and teaches the skills of interviewing patients is so life-changing that it ought to be taught in every Medical School, every Chiropractic school, in every kind of service profession. It is amazing to see how much patients will tell you about themselves and their problems when they are interviewed in this way. It is equally amazing to see the change in oneself and one's attitude toward patients, staff and people in general. If you want to love your work and love your patients; if you want to really be a healer of the whole person, this is the class for you. I wish I had had the sense to take this 30 years ago." Life changing Program! Such dedication from beginning to end. I�m proud to be an Institute graduate! Thanks for providing the support and guidance to become a Five Element practitioner. Amazing! I can�t believe how much I�ve learned. By far the most fun school I�ve ever attended. Even though it was rigorous and structured at every step, it was satisfying at a deep level. I now feel I have a new vocation that I could happily practice my entire life. Most of us want a bonded colleagueship, a mentor-- or two or three, a vocabulary shared between us and those we value, and, feedback and collaboration when needed. 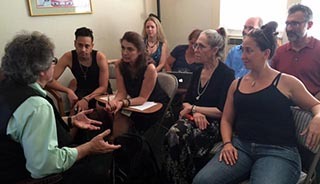 Neil Gumenick's Classical Five Element Acupuncture Program creates an intimate community, a safe forum for all to see and be seen. It is at this foundation we grow as true healers. Without it, we are technicians. To get there, you cannot rely on webinars and article perusing nor short weekend courses. You must delve into the experience of what it means to be a true healer. 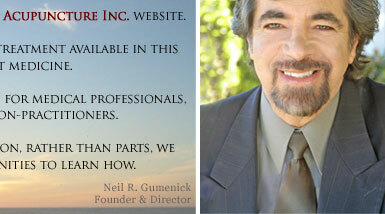 What Neil has to offer is deep, concise, meaningful, experiential and potentially life-changing. If you are ready to take the next, deeper step, this Program is for you. You will evolve. You will grow. You will be supported. You will be welcomed into the village you hoped existed. The classical five-element community is a rare and beautiful gem. The results your patients receive are immediately tangible and the payoff for you is literally priceless. I am glad I stuck it through 4 years of TCM school to finally learn 5 Element acupuncture in this program. I feel I can finally practice the medicine in a way that resonates with me and treats the whole person, including their spirit, which is more important than anything most of the time. Neil, you are an engaging and amazing teacher! Thank you for your dedication and sharing of wisdom! There is nothing more gratifying than having a mentor in my life. In this program, Neil is truly carrying on the tradition of this medicine by teaching it the eay it was taught to him by the founder, J.R. Worsley. This is a most noble act and I am proud to continue as his student. I am eternally grateful. The Classical Five-Element Acupuncture Program is the real deal! The curriculum is comprehensive; the instructors are generous and knowledgeable, and the medicine itself is very profound. After practicing Western Medicine for over 25 years, this elegant style of medicine has renewed my passion for the Healing Arts. I had taken other Five Element acupuncture courses before enrolling in Neil's Program, and there is simply no comparison when it comes to quality and integrity. I am confident I will have the necessary knowledge, experience, and support to practice Five Element Acupuncture in its pure form when I graduate from this course.